Saying good-bye is never easy especially when it it is to someone whom we have loved from many years. 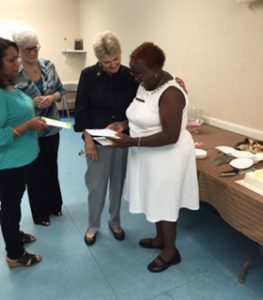 On Sunday, September 20, 2015 we gathered around the baptismal font for a service of recognition and thanksgiving for Ruling Elder Norma Campbell who is leaving our congregation and moving to Florida. She has been a member of this congregation for twenty-four years. She has served as an ordained Ruling Elder for 15 years. She has served as secretary of the Women’s Guild, sung in the choir, helped in the yard sales and fellowship meals of the church, she has been active in the prayers and compassionate ministries of the church. Additionally, she has always baked the most incredible and delicious cakes for us to enjoy. Elder Campbell shared the significance that the church has had on her life. As the living body of Christ, the church, composed of its people have been for her a source of strength in very difficult times. Just a few months after arriving here her husband died, joining the church triumphant and she had to adjust to the challenges of widowhood and single parenthood. More recently there was the brutal death of her son, the torturous days during the court room trial seeking justice for him, and other major and minor challenges that life has presented. Through it all the faithfulness of Christ and the love of her church family at Brentwood Presbyterian Church have been her strength. Saying good-bye is never easy even though it will be for a season. Some day in eternity we will all be together again. But for now we know that God has a new home church waiting for Norma. There she will continue to bloom and bless others; even as others will be a blessing to her. Go with God our friend. Go with God.